Home Tags Posts tagged with "last of the mohicans"
Actor Russell Means, who played a leading role in The Last of the Mohicans, has died at the age of 72. Russell Means played Chingachgook, the adopted father of Daniel Day Lewis’s character Hawkeye, in the 1992 film. He was also a former American Indian Movement (AIM) activist, who helped lead a 1973 uprising at Wounded Knee. Russell Means died on Monday at his ranch in Porcupine, South Dakota, a spokeswoman for the Oglala Sioux Tribe said. Donna Salomon, the tribal spokeswoman, called Russell Means’ death a “great loss” for the tribe. 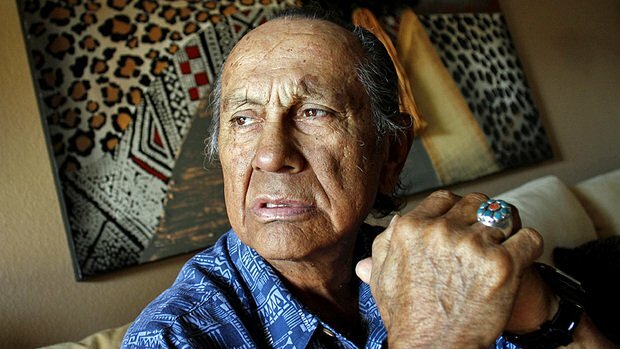 In August 2011, Russell Means announced he had inoperable throat cancer and told the Associated Press he was eschewing mainstream medicines in favor of traditional Native American treatments. The Last of the Mohicans was his first film role and he went on to also appear in films such as Oliver Stone’s Natural Born Killers. He also voiced Chief Powhatan in Disney’s 1995 animated movie Pocahontas. Russell Means guest starred in US TV series Curb Your Enthusiasm in 2004. He also made two albums of protest music with lyrics he wrote – Electric Warrior and The Radical. The AIM’s armed occupation of Wounded Knee in South Dakota – the site of an infamous massacre of Native Americans by US soldiers in the late 19th Century – lasted for 71 days. The protest followed the failure of AIM followers to impeach the elected tribal president, whom they accused of corruption. Russell Means ran unsuccessfully for president of his tribe and for the Libertarian nomination for US president in 1988. But he was also a controversial figure, partly because of the AIM’s alleged involvement in the slaying of one of their activists Annie Mae Aquash in 1975. Authorities believed it was the work of AIM members because they suspected she was an FBI informant. Paul deMain, a Native American journalist who researched the case, said the AIM’s leaders know who ordered Aquash’s killing but have covered up the truth for decades. Russell Means blamed one of his fellow AIM leaders, Vernon Bellecourt, for ordering her killing. Vernon Bellecourt denied the allegations in a 2004 interview. He died in 2008. Russell Means was married four times and leaves ten children.